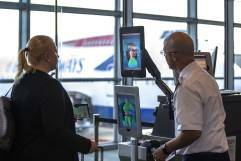 If you’re travelling by plane in the United States any time soon, you may come across facial recognition technology to check in, drop off a bag, go through security and board your flight. In August, facial recognition at an airport near Washington, D.C., helped catch a man attempting to enter the U.S. with false documents, according to U.S. Customs and Border Protection. The facial recognition technology at Dulles Airport (where the man was caught) uses iPads at departure gates. This is how it works: a passenger gets his or her face scanned, then the image is compared with a gallery of photos pulled from the U.S. Department of Homeland Security, including passport or visa photos of all travellers on the flight. According to the Denver Post, privacy advocates and civil libertarians are concerned about the devices’ accuracy and potential misuse of the information they collect. The American Civil Liberties Union (ACLU) has also criticized the technology citing discrimination and false matches. “Facial recognition software is easily tripped up by changes in hairstyle or facial hair, by aging, weight gain or loss, and by simple disguises,” the ACLU said in a statement. “Travelers increasingly use biometrics, such as fingerprint and facial recognition, in their daily lives to access their mobile devices, apps, and accounts. As biometric usage continues to spread throughout the consumer market, popular perceptions have evolved to appreciate the convenience and security biometric solutions can offer in the commercial aviation sector,” the TSA said in a report.